Yesterday, the UAE summoned Qatar’s ambassador in Abu Dhabi to hand him ‘an official protest memorandum’ over remarks Al Qaradawi made in a broadcast sermon last month, criticizing the UAE for supporting Egypt’s new government. The UAE, however, says those remarks have not gone far enough. ‘We have sought during the past few days to contain the issue through continuous top level contacts between the two countries, but to no avail, except for an official statement that did not include any decisive denunciation of the contents of Al Qaradawi’s speech. Nor did it offer any guarantees that this will never happen again. The GMBDW reported last week that a Dubai police official had urged Qatar to stop Qaradawi what from what was describing as insulting the UAE following televised comments in which he accused the UAE of being against Islamic rule. Youssef Qaradawi is the most important leader of the Global Muslim Brotherhood and is the de facto spiritual leader of the movement. He is also considered to be the “spiritual guide” for Hamas and his fatwas in support of suicide bombings against Israeli citizens were utilized by Hamas to justify their operations. In 2004, Qaradawi turned down the offer to head he Egyptian Brotherhood after the death of the Supreme Guide and now denies that he has any relationship with the Egyptian Brotherhood. He is based in Qatar and has said the Qatari Emir has protected from being designated as a terrorist by the U.S. He has also reportedly amassed substantial wealth by serving as the Shari’ah adviser to many important Islamic banks and funds. Qaradawi is the head of the Union of Good (UOG), a worldwide coalition of charities helping to raise funds for Hamas and is the leader of the European Council for Fatwa and Research (ECFR), the theological body of the European Muslim Brotherhood. MEMRI has produced two video compilations of Qaradawi’s extremist statements. 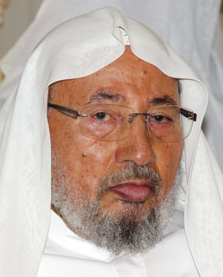 Qaradawi been banned from entering the US since 1999 and UK since 2008. Last year, authorities also refused him entry into France. Last September, the GMBDW reported that Egypt’s chief prosecutor had issued an arrest warrant for Qaradawi who was accused of inciting the killing of Egyptian security forces and meddling in the country’s affairs. The same report also noted that Qaradawi was asked to leave Kuwait as a result of were been described as “divisive remarks he has made inciting violence and bloodshed.